Without doubt the most important welfare concern for seafarers is communication back home. Seafarers now want easy, either free or cheap, access to email and internet both at sea and in port. A survey of seafarers, published earlier this year, found that seafarers spent $150 per month on communication with home at sea and in port. With able seafarers earning $636 per month basic wage (IBF/IMEC figures) or less, this is a considerable proportion of their income. The survey on crew communications, by Stark Moore MacMillan, was completed by nearly 1,000 Filipino seafarers last year. It also found that 68% of seafarers have access to communication while at sea although only 46% had access to free services. Only 20% had access to free email. 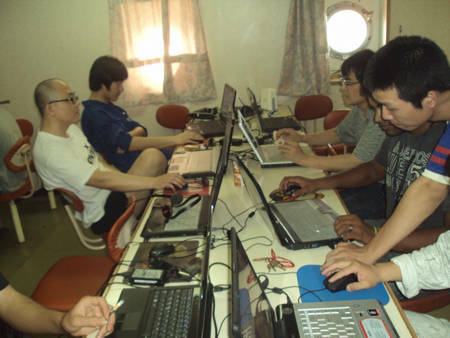 The service that seafarers desired most was wifi access at sea so that they could connect their laptops. According to the survey, seafarers were prepared to pay for some of the services. The survey was conducted with the help of crewing agencies that provided seafarers to reputable shipping companies. In the Maritime Labour Convention that came into force in August, there is only a small section, rather surprisingly, covering communications for seafarers. Tucked away in the guidelines in B3.1.11 the convention states that "consideration" should be given to include "reasonable access to ship to shore telephone communications, and email and internet facilities, where available, with any charges for the use of these services being reasonable in amount". The convention was adopted in 2006, before the widespread use of Facebook, twitter, smartphones and WiFi. As a guideline, this is a non-mandatory part of the MLC that means that flag states and others bound by the convention do not have to enforce it. There is also a question about what is meant by 'reasonable' access or charge. Surely, seafarers paying over 20% of their basic salary on communication is not a reasonable charge. Good employers know that communication with home is good for seafarers' welfare, morale and their retention. While unrestricted and universal access to the internet at sea via satellite is currently prohibitively expensive more needs to done to give seafarers cheaper or free access to email, sms, voice communication and, where possible, to the internet. In ports many seafarers gain access to the internet and phones via seafarers centres or by welfare workers bringing 'mobile' wifi, dongles, and phone cards on board. Unfortunately not every port has a centre or a welfare worker. Even where they do, there may not be enough time for a seafarer to visit the centre or have a welfare worker come on board. One solution is to allow seafarers to have access to portwide wifi. Some ports, such as Antwerp, Montreal, and Dover already do this. ISWAN has published a report on seafarers access to Wifi in ports and it can be downloaded from here. If seafarers cannot use seafarers' centre or make use of visiting welfare workers bringing the internet onboard, then communication with home becomes expensive. It is now 2013 and the internet is part of our everyday lives. Seafarers are no different from us. They live tough and isolated lives while at sea. Frequent communication with home makes the life they choose at sea much more rewarding and makes a key contribution to their wellbeing. All parts of the industry need to do more to ensure that seafarers have much more access to cheap or free communication both onboard and ashore.